Maybe you are just beginning to accept that we (fortunately) are entering a post-religious world. (The Pope is having a hard time accepting this too but he is hastening the process). Meanwhile I suggest you have a raucous (bordering on the sacriligious) Seder with as much looney humor as possible (e.g. 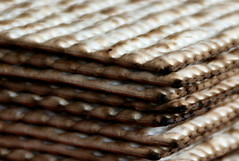 instead of “next year in Jerusalem” the Seder Leader can suggest that Israel move to Jamaica and rename itself Jewmaica (“why on this night do we smoke the bitter herb?”) Your kids will love it and it will be something they (and you) look forward to (i.e. – the best of family traditions). Sincerely – Jew married to a Christian. Well. . . I’m the last person on earth who could in good conscience question the amount of angst involved in religious differences. I spent too much of my married life negotiating the compromises between my husband’s sincere belief in the Catholic “faith of our fathers” (actual title of a bygone hymn)and my equally sincere belief that all religions, however interesting, historically & psychologically significant, etc.,are a crock. Increasing age & tolerance of differences made our life much easier. So. . .getting old is the answer??? @daryl-like this idea. aging mellows all of us. Mom and Dad sent me to every different church they could identify – all Christian, mind. Probably only because they didn’t know anyone Jewish. They never baptised me because they wanted me to make my own choice…I’ve never followed through on it never having become Christian in the end. No but I will look her up. Thx for the rec! Delia … I found your comments to an interesting read. My simple observation would be that you’ve seemingly not been “hungry” to discover God … other priorities.If you choose to sincerely ask Him to reveal Himself to you … my experience is that He will meet you. Blessings! Your post was great–hope the comments at PoliticsDaily did not stress you out. For affirmation and encouragement in your choice “not to choose” read my blog, onbeingboth.com. thank you susan. looking forward to checking out your site! thx for dropping by! Delia – Sorry to be responding to this so late. I just found your site. Excellent writing, if I may say. I read your comment above and it broke my heart. To think there are periods of time during the year where you suffer over something as ridiculous as religion. To hear that religion has placed a stumbling block in what is probably a happy marriage. It’s a terrible thing. I have some thoughts I’d like to share, let me know what you think of them. To preface them I’d like to say that Judaism is a beautiful religion. Christianity’s fore fathers were jews (the apostles). Their traditions are beautiful. Judaism is historically and scripturally accurate. Catholicism has never been very biblically based. I know, that statement is not very popular with most catholics, but go with me for just a moment. I can write a thesis or 2 on the inaccuracies of Catholicism, but wouldn’t want to bore you. I’ll touch on a few minor examples, and then get right to my point. Remember these are only examples to support my later point, try and move past them quickly. Mat 23:9 states; ‘And call no man your father upon the earth: for one is your Father, which is in heaven’. Clearly catholicism relies heavily on the pope being our heavenly father on earth, he requires us to do that. Sounds nice and all, but there’s no biblical basis for it. In fact, through the bible, God specifically states not to do so. Another verse in Matthew that has been grossly misinterpreted by catholicism, it starts at Mat 16:13 and goes through Mat 16:21: Jesus comes to the disciples, inquiring to them who people are saying that He is. It is Simon Peter, Simon Barjona, that responds with accuracy to Jesus. “Thou art the Christ, the Son of the living God.” Mat 16:17-18 ‘And Jesus answered and said unto him, Blessed art thou, Simon Barjona: for flesh and blood hath not revealed it unto thee, but my Father which is in heaven. And I say also unto thee, That thou art Peter, and upon this rock I will build my church; and the gates of hell shall not prevail against it’. Jesus clearly stated that His being the Christ is the rock upon which the church would be built, with the gates of hell not able to prevail against it. And there is many other places in the old and new testament that back that up. No where is there scripture to back up Peter being that foundational cornerstone. The big argument being the confusion over the words petros and petra. Petros- a stone, a smaller movable stone. Petra- a large massive rock, a large boulder, a foundation stone. Many times in other verses, the bible states that Jesus is the cornerstone, the foundation of the church. So, Jesus did not say that the church would be build on Peter, a mere disciple. And there is no additional scripture to back that up. Another place where Catholicism errs is what duties were given to which disciples. Jesus sent Peter to reach out to the Jewish communities. Paul was sent to preach the Good News to the gentiles. This is very clear in several books of the new testament. OK, so I move on. Please remember, religion is man-made, and therefore fallible, non-perfect. God, and His written Word are infallible and perfect in every sense. God wants you to have a relationship with Him. A close. personal relationship. He offers His love, unconditionally, whether you accept it or not. Whether you believe it or not. He faithfully and continually loves every single one of us, whether we believe on Him or not. He did not call for us to be religious. In fact, the only people that Jesus angered towards were the pharisees, the religious leaders. I think this speaks volumes about His desire for us to have a relationship with God, the Father. Not to adhere to a religion that separates and divides. It is my wish for you that you embrace the beautiful place that God has put you. That you and your husband love & honor one another, that you teach your children about God and His love… and that you are able to move past the guilt-ridden, separatist, inaccurate catholic beliefs that have alienated so many from God and His love.